The primary hero of the original three Star Wars films is Luke Skywalker. But Luke is not the Christ figure, at least not primarily (read here for more on the Christology of Star Wars). Most of the time he functions as the Everyman: the representative of humanity. Luke eventually finds out, much to his dismay, that he is the son of Anakin Skywalker, aka Darth Vader. This means a couple of things: (1) that the Force is strong within him, as it is apparently hereditary (midichlorians again?) and (2) that he has the potential to be turned to the dark side, just as his father was. What this says about humanity is that any of us can use our free will to choose good or evil. We can embrace the light or choose to be selfish, seek personal power, and embrace the dark side. We all have the potential to go either way. The dark side is very tempting, because it promises power over others. This is, in fact, the real evil behind the Galactic Empire (and during the Cold War, the threat of communism) — that is, the curtailing of people’s freedom. To give in to the dark side is to use one’s free will to take freedom away from others. This gets a bit confusing, however, in Episode V: The Empire Strikes Back (1980). There, Luke is already impatient to complete his training as a Jedi when he finds out that his friends are in trouble. The Jedi master, Yoda, tries to discourage him from cutting his training short to save his friends. But we’ve been led to believe that unselfishness and the protection of the vulnerable are the hallmarks of the good side of the Force. So clearly, the temptation here is not to give in to the dark side. This whole thing never really worked for me because it seemed to me that Yoda wanted Luke to let his friends die — and then, when he returns to Yoda in Episode VI: Return of the Jedi (1983), Yoda tells him his training is complete. So either his training was complete before he saved his friends, and then Yoda was wrong to try to stop him, or he needed to save his friends to complete his training, in which case Yoda was wrong to try to stop him. In any case, Luke’s impatience is meant to show that there is no guarantee he will not give in to the dark side. And when he loses his hand in the duel with Vader, and that hand has to be replaced by a cybernetic hand, we see what could be the beginning of Luke’s loss of his humanity and transformation into a machine — following in the path of his father. This article is from a chapter in “From Star Wars to Superman.” Click image to order as a paperback or ebook. On the other hand, Luke’s sister Leia never falters. There is no danger she will turn or be seduced by the dark side of the Force. Even when Darth Vader tries to use a mind probe on her to find out the location of the rebel headquarters, she is able to resist it. Of course, we later find out that Darth Vader is also her father, and that the Force is strong in her — apparently stronger than in Luke. So although the force is supposed to be omnipresent, surrounding and penetrating all living things, there is this recurring assumption that some people have it more than others (that is, they have a higher midichlorian count). Those for whom the force is not so strong are described as “weak-minded,” and it’s fair game, even for a Jedi, to use the Force to manipulate them. After using the “Jedi mind trick” on some stormtroopers at Mos Eisley, Obi-Wan Kenobi says, “The force can have a strong influence on the weak-minded.” Notice that he didn’t say “on evil people” but on anyone who is weaker. Although I doubt George Lucas intended this, a gnostic elitist spirituality has crept into the Jedi’s religion. In a context where access to divinity is hereditary, they look down on those to whom less is given. This elitism effectively divides humanity into two classes. They are the “haves” and the “have-nots,” not in the economic sense, but in the spiritual sense. For the haves — that is, for those who are enlightened — there is a more optimistic anthropology. They have access to the Force that others do not have, and assuming they have completed their training and are mature in their faith, they cannot be turned to the dark side. There is also a hint of the gnostic view of humanity, which says that each person has a spark of the divine within himself — meaning that each person is divine. Notice the mantra in Rogue One: “I am one with the Force, and the Force is with me.” To say, “I am one with the Force” goes further than to say that divinity surrounds and penetrates us; it says that we are the Force — we are divine. For the unenlightened (whether they are evil aggressors or simply ignorant), there is a much more pessimistic anthropol­ogy assumed. “Power corrupts,” as the saying goes, so anyone who gains power but is not enlightened, as a Jedi is, will most likely give in to the temptation to abuse that power. And for those unenlightened who never have power, C3PO speaks for them when he says, “We seem to be made to suffer. It’s our lot in life.” So in the division of spiritual classes, the enlightened good guys have to fight the unenlightened bad guys to save the unenlightened innocents. It’s also important to notice the gnosticism inherent in the story’s treatment of the body. Obi-Wan Kenobi tells Luke, “Your eyes can deceive you — don’t trust them. . . . Stretch out with your feelings.” Therefore, your physical senses (the senses of the body) are not trustworthy, but your feelings are trustworthy. To be clear, though, when they say “feelings” they are really talking about the mind, over against the body. We can tell this is the case when we see that a person’s “feelings” can betray him. This happens when Darth Vader reads a person’s mind. So “feelings” here really means the mind. At the end, Luke hears Obi-Wan’s voice again, “Luke, trust your feelings. . . . Use the Force, Luke. . . . Let go.” To use the Force is to reject the bodily senses, and also technology, as untrustworthy. There is a gnostic dualism here that elevates the mind over the body to the point of disregarding the body. It is true, for example, that Darth Vader’s humanity represents the good in him, and the extent to which he is a machine represents evil in him. But “humanity” here does not mean mind and body: it means the mind only, as Darth Vader’s human body has been to a large extent replaced by technology, and Obi-Wan’s body is destined to be dissolved into thin air. Finally, I think the tractor beam in Episode IV is a very significant symbol. Our team of heroes is trapped on an enemy ship. They can’t leave until the tractor beam is turned off. To me this tractor beam represents the loss of freedom. Freedom has to be restored, and, in fact, Obi-Wan Kenobi gives his life to turn off the tractor beam and restore freedom. This act is what makes him the Christ figure of the original Star Wars films. The Christology and soteriology of Star Wars is an amalgam of both Arian and gnostic elements. Technically speaking, gnosti­cism is always a syncretism of a variety of systems, but in this case the Christology and soteriology seem to be coming from different directions. The Christology is Arian, in the sense that the savior is really just setting an example, and anyone may become a savior by following that example and responding appropriately to the previous savior. This idea of becoming a savior (rather than coming as the savior) is the hallmark of the Christology of ascent inherent in Arianism. But on the other hand, salvation is gnostic because salvation is through enlightenment, since it is the secret knowledge of the Force that allows one to make the right choice and follow the example of the savior. In Star Wars one saves oneself by making a self-sacrificing choice. This is not the only contradiction. When Obi-Wan Kenobi says, “Many of the truths we cling to depend on our own point of view,” he basically undercuts the credibility of everything else he says, including his teachings about the Force. I would have expected him to say something like, “Many of the beliefs we cling to are based on the fact that we don’t know the secret truth.” That, at least, would have been consistent with the gnos­tic undertones of the Jedi religion. But to espouse the kind of blatant relativism that this statement implies begs the question as to whether Obi-Wan’s truths about the Force are any more truthful than Han Solo’s early skepticism. In another blatant contradiction, Obi-Wan is clear that aggression belongs to the dark side, and Obi-Wan’s and Luke’s salvation comes through confrontation without aggression. Yet it is always assumed that the rebels must use aggression in a preemptive strike against the Death Star. As we saw in the most recent Star Wars film, Rogue One, it is clear that to the Galactic Empire, the rebels are terrorists. We should be very careful about thinking that revolution will necessarily bring peace. It almost didn’t work in North America, and the revolutions in France and Russia were extremely bloody (and antagonistic toward the Church). Granted, the Death Star is a weapon of mass destruction, and so its destruction could be called an act of self-defense. Still, the juxtaposition of the Jedi’s self-sacrificial pacifism with their own willingness to wield the light saber, their support for the rebellion, and the assumption that aggression is necessary to avoid slavery should steer us away from any overly simplistic view of pacifism and violence. Something that has always bothered me about Star Wars is the idea that Anakin Skywalker was predicted to bring balance to the Force. But it seems as if, before he enters the picture, things are leaning more toward the good side. The Jedi are strong, and the emperor has not yet come to power. And then Anakin apparently brings balance by bringing in more evil! To be fair, he eventually gets rid of the emperor by throwing him into the reactor core of the second Death Star, but in what is probably the most disturbing aspect of Star Wars, it seems that the balance of good and evil is more important than getting rid of evil. In other words, evil is necessary to maintain the balance of the universe. In the animated series Clone Wars, it is stated that if the balance between the dark and light sides of the force is not maintained, the entire universe could be destroyed (3:15). If, then, we assume that preventing the destruction of the universe is the ultimate good, it seems that good includes evil. There has to be the same amount of evil as good in the universe to keep the universe going. So, at the end of the day, evil is necessary, and therefore it’s good. The very concepts of good and evil lose all meaning. What this tells us is that the divine force is not really benevolent, in the way the Judeo-Christian God is benevolent. The force is morally neutral, as well as being impersonal. In other words, the Force doesn’t really care about the good as the moral expectation for everyone — the force cares only about maintaining the balance. This further implies that evil is a created substance, no less than good. So whoever or whatever created the universe presumably created evil as well as good and built that balance into the original creation. This, too, is a gnostic idea. And it means that divine power can be used for evil purposes, just as much as good. A person (a Jedi) can manipulate the Force, and the Force will not prevent itself from being used for evil. By contrast, the God we know and trust cannot be manipulated. Our God is both personal (caring) and omnibenevolent (always good). God is not simply an impersonal power; He is love (1 John 4:8). And our Scriptures do not promise that someday there will be balance between good and evil; they promise that good will triumph over evil, and life will have a final victory over death. Good and evil are not equal opposites, as in some Zoroastrian version of the Yin and Yang. We know that good is ultimately more powerful than evil, and we know that good is real, and evil is not. Evil is not something created by God, but is only the result of the misuse of free will and the rejection of God’s will. Evil is not a force. The real force is the gospel, as St. Paul said: “For I am not ashamed of the gospel. It is the force of God for the salvation of everyone who believes: for the Jew first, and then Greek. For in it is revealed the righteousness of God from faith to faith, as it is written, ‘The one who is righteous will live by faith’ ” (Rom. 1:16–17). It is the power of the gospel of the Cross that shuts down the tractor beam of temptation and sin. And it is the force of grace that can empower us to repent and turn from darkness and death toward light and life. But without the Cross and God’s grace we could never make that turn. We could never save ourselves simply by following the example of others who make unselfish choices. It takes the force of divine intervention, in the Incarnation and in a Savior who gives His life for us — not only for our benefit, but on our behalf, in place of us. What we need is not the balance of good and evil but reconciliation with our Creator, who did not create evil. In an interview, George Lucas once said that he hoped the spirituality in his Star Wars movies would encourage young people to have faith in God, “more a belief in God than a belief in any particular religious system.” Unfortunately, Lucas gave his viewers a gnostic view of God that makes God the author of evil, and an Arian view of salvation that puts the burden of salvation on every individual. image: Disneyland Paris Star Wars by marcosantiago via Pixabay. 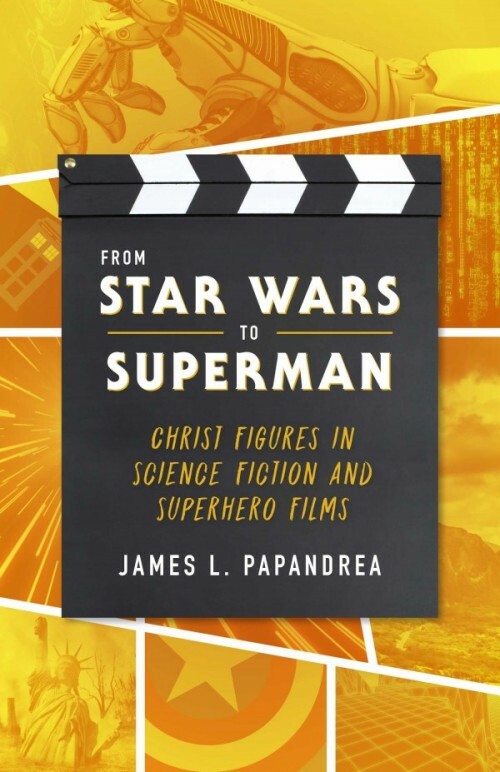 Editor’s Note: This article is adapted from a chapter in Dr. Papandrea’s From Star Wars to Superman: Christ Figures in Science Fiction and Superhero Films, which is available from Sophia Institute Press. James Papandrea is a teacher, author, speaker, and musician. He is the Associate Professor of Church History at Garrett-Evangelical Seminary (on the campus of Northwestern University) in Evanston, IL.